Freeze dried foods are those that have undergone the process of lyophilization, or freeze drying, which allows them to have a vastly longer shelf life while at the same time retaining most of the nutrients. Studies of nutrient retention in freeze dried foods, specifically freeze dried fruits, have already been supported by the American Institute for Cancer Research (AICR). 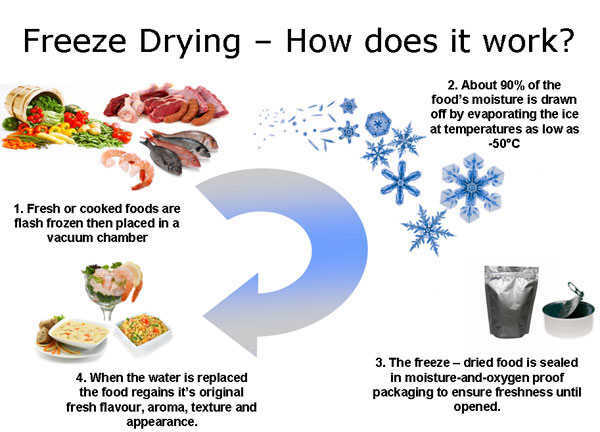 Freeze drying foods involve removing water from frozen food, and commercially produced packets and tins of freeze dried foods require rehydration first before consumption. The removal of water makes freeze dried foods lightweight and convenient for travel and especially long term storage as emergency supplies. The history of freeze drying goes way back to the Incas, where the principles used in freeze drying are applied to store their crops. The food crops are stored in the high altitudes, particularly in the Andes, where the crops are frozen by the low temperatures and the low air pressure slowly removed the water from the crops. Fast forward to World War II, where the process of freeze drying was reportedly applied to blood plasma and penicillin for easier transport during the war. Decades later, the innovations that utilize freeze drying increase – pet preservation, pharmaceutical products, and after the war the process was done to preserve food. The first known commercially produced freeze dried food was Maxwell House’s freeze dried coffee. The market for freeze dried foods have expanded over the years, from being utilized asspace food to camping stock and stockpiled in case of emergency, as usually freeze dried foods can stay unopened in room temperature for more than twenty five years and have been tested to even long timeframes when stored in cooler environments. How Are Freeze Dried Foods Made? Before ending up as freeze dried foods, the raw materials – food suited for such preservation techniques – must first undergo lyophilization, which has three major steps: Freezing, primary drying and secondary drying. There are other processes involved before and after these three steps, but these three are the most essential processes in freeze drying. Before the three steps, there are several things to do first before undergoing the freezing process. First is to inspect the produce, to check if there are any impurities. There is also the need to check if the produce is fresh, and to avoid bulk spoilage, processing is done seasonally – according to the harvest period of the various produce. For some other kinds of produce, it will need to be cooked first before freezing as with the Mountain House range. And viands that will be served as freeze dried foods will have to be cooked as well. Freezing is the first and most important step in the entire process, as its completion will determine the success of the entire freeze drying process. The food will have to be frozen below a given critical temperature, and the food must be frozen completely, because if there are portions which aren’t completely frozen before going to the next step, it may compromise the stability of the final product. Primary drying involves removing the ice which formed from the frozen product during the previous process by means of sublimation – which is the process by which a solid becomes gas without going through the liquid state. This stage of the freeze drying process is said to be one most time-consuming, but through this p rocess, the frozen food will have lost 95 to 97 percent of its water content. The secondary drying includes the removal of the remainder of the frozen food’s water content by incorporating heat. By diffusion and desorption, the frozen food can have at around 99.5% of its water content removed. The conditions for the secondary drying are quite different from the primary drying; the pressure in the chamber is lowered down, the contrast to its relatively high pressure during the primary drying. After the following processes, the food is taken out of the machine and is checked to make sure they are completely drained of water content and also to check if there are any impurities which may be mixed up with the freeze dried food. After this, food is segregated and is prepared for packing, with some being ground up before packing. Freeze Dried Food UK - The Advantages? As mentioned above, freeze dried food has a long shelf life, which is very advantageous with stockpiling in case of emergencies. When unopened, packets or cans of freeze dried food can last for over 25 years. The packets can last for another 2-6 months without refrigeration when opened, while freeze dried foods stored in cans can be stored for another 2 weeks when opened. And dealing with the nutritional value of freeze dried foods, without water, some vitamins are retained, and these are slowly being removed with the application of heat. The taste and aroma aren’t compromised either and freeze dried food doesn’t shrink, meaning it has the same dimensions as the fresh food. One of the best assets of freeze dried foods is that they are very light. This is due to the removal of water. Many fruits and vegetables have 74-96% of its weight composed of water. When processed, freeze dried foods become lightweight and with packaging includes pouches, it can be great for traveling and easy storage. Another advantage of freeze dried food is the range of foods one can buy as freeze dried. Aside from fruits and some vegetables, freeze dried food varieties include entrees, pre-cooked meals and even desserts. In case of extreme emergencies, having freeze dried foods in stock can keep families fed, and with the varieties, one can plan on different viands each day. One more plus on the side of freeze dried food is that the time to prepare freeze dried foods is low, just add water – some instructions call for hot water especially if the pack is pre-cooked – and wait for it to rehydrate. There are some other packs that can be consumed even without rehydrating. Freeze Dried Food - The Disadvantages? The most felt disadvantage of freeze dried foods is the price. Due to the processing it takes to produce it, freeze dried foods can range from £4 for single serving pouch to £15for a pouch good for four and from £32to £42 for a #10 can, depending on the meal. And another disadvantage would be that some of the variants of freeze dried foods take up space – less space than their fresh counterparts, but space nonetheless – because the dimensions of freeze dried foods are almost the same as fresh foods. How Does Freeze Dried Foods Compare To Other Food Storage Methods? Freeze dried foods differ so much from traditionally canned foods and though freeze dried foods and dehydrated foods have been mixed up, they are quite different from each other, from the processing, all the way to the price. Freeze dried foods, as mentioned, have a long shelf life, longer than traditionally canned food, which may last unopened for 3 years after it has been manufactured, and still longer than dehydrated food, which may last for more than 15 years. When it is opened, freeze dried food pouches which can last 2-6 months opened and not refrigerated and freeze dried cans for 2 weeks, longer than traditional cans which can only last for 8 hours in room temperature, but shorter compared to dehydrated foods, which other than milk and eggs can only last for 3-6 months without refrigeration, can last for 1 and ½ years opened (though closed with a plastic lid) and in room temperature. For compactness, freeze dried food has almost the same dimensions as the original product, in contrast to dehydrated food which can be very compact because of the water lost during the processing of the product, and traditionally canned foods are bulky due to the addition of water to the product inside the can. Cost-wise, traditionally canned foods costs £10 to £15 per can, while dehydrated #10 cans can cost £10 to £30 per can, and freeze dried food #10 cans can be quite expensive, ranging from $£30 to £40 per can. Freeze dried foods are available in variants that aren’t provided for by dehydrated or traditionally canned foods. For dehydrated foods, though fruits and vegetables are available through this process, meat cannot be dehydrated. Though traditionally canned foods also have a wide range of foods, these may not be readily available due to a range of varied incidents, emergencies and other external factors. For the number of preservatives, traditionally canned foods have varying amount of preservatives while dehydrated foods may or may not have any preservatives – about half of the dehydrated foods in the market have preservatives. Most freeze dried foods, however, have almost no preservatives. Due to the levels of preservatives, traditionally canned foods have a “canned taste” when consumed. Some dehydrated foods taste like frozen foods while some taste the same as fresh foods, and most freeze dried foods taste like their fresh counterparts. For the cost of a 1 year supply varies per food storage method. For traditionally canned food, a years’ supply can cost for around 52 weekly carts divided by the number of members of the family, while a years’ supply of dehydrated food can cost from £650 to £2500 depending on serving and variety of foods, and freeze dried food good for one year costs around £2000, also depending on the variety of the food chosen. Why Is Freeze Dried Food So Expensive? A years’ supply of freeze dried food is almost twice to thrice as expensive as other food storage methods, and this is primarily because of the process needed to achieve the final product. The equipment is quite expensive and so is the operational cost. The cost can be seen from the first step – gathering the raw ingredients. Guaranteeing that the foods to be processed or cooked first and then process is fresh is essential, and thus there is the need to invest in fresh produce. The equipment, as noted above, is quite expensive, with the cheapest unit running at least £5,000 and ranging up to £500,000. Aside from the equipment, the process itself is costly. For the preliminary processes, costs may cover the price of screening for bacterial content and other impurities, and costs after the drying process may include another round of screening, use of mills for grounding, and finally, sealing machines – not to mention the cost of the actual packaging. Why Choose Freeze Dried Foods? Though expensive, freeze dried foods are worth the price in terms of: shelf life, since freeze dried foods can last longer than most food storage unrefrigerated; nutrition, as freeze dried foods retain most of the nutrient content than others; varieties, as there are so many options to choose from; and finally, weight, as the process done for freeze dried foods leaves the final product lightweight and perfect for campers. Why Are Freeze Dried Foods Cheaper In The US? One of the possible reasons why freeze dried foods are cheaper in the United States of America may stem from the policies regarding food production and consumption in comparison to other nations. For example, the food ban in Europe may slightly increase the cost of acquiring produce, whereas the US has no such ban in their territories. Another likely reason would be the purchasing power of the currency. It may be that the US dollar may be able to purchase more than if it were bought by Euro, for example. One more reason why freeze dried foods are cheaper in the US, compared to the rest of the world, maybe because of the establishment of highly efficient distribution and storage systems for US and Europe, which may hasten the process and save costs in the long run.